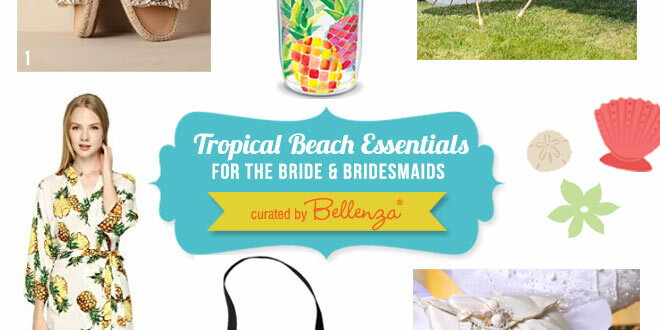 Home / Packaging Favors & Gifts / Tropical Beach Wedding Essentials for Your Bridal Party, Ceremony and Guests! Take your pick from these casual-chic beach wedding accessories for you and your bridesmaids – featuring seashells, pineapples, starfish, and tropical blooms. 1 – Satine Espadrilles – Slip into these elegant espadrilles embellished with sparkly crystals and ivory satin straps. From Badgley Mischka, via BHLDN. 2 – Tervis “You Had Me at Aloha” Clear Water Bottle with Lime Green Lid – Keep the bridal party hydrated from ceremony to reception with fun tropical-themed tumblers. Ships from and sold by Amazon.com. 3 – Paper parasols – Have these charming paper-and-bamboo sun shades to complete your bridesmaids’ look. Available in large, medium and small sizes from Beau-coup. 4 – Tropical Kimono Pineapple Print Bridesmaid Robe – Wear coordinated tropical-print kimonos for the pre-ceremony photo shoot. Available via Amazon. 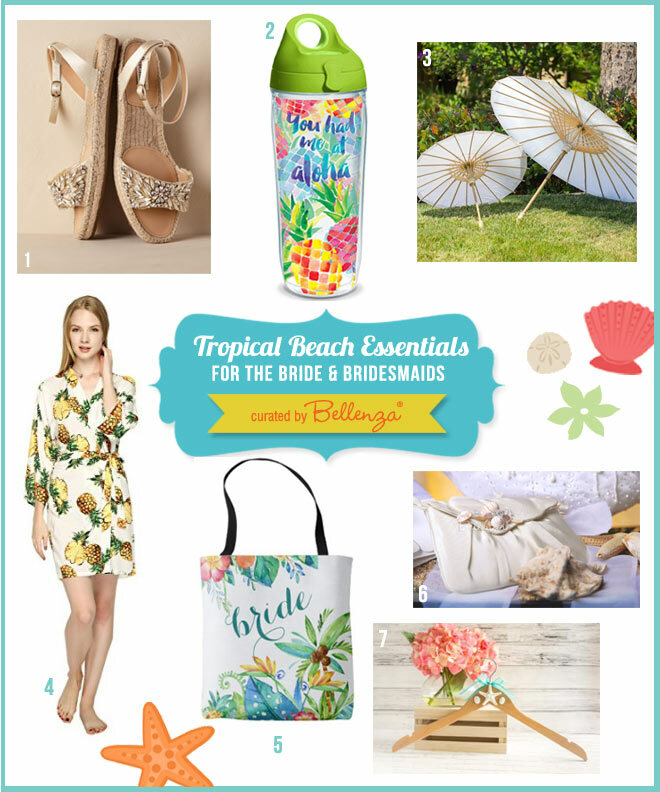 5 – Tropical Floral 2-sided Custom Bride Tote Bag – Gift each bridesmaid (and yourself!) with a personalized and practical beach tote. Such a great keepsake, too. By About the Occasion by T.K. Goforth, via Zazzle. 6 – Wristlet purse with seashell accent – Adorned with a cluster of shells, this elegant ivory silk clutch is a perfect bridal party accessory. A Bellenza exclusive. 7 – DIY starfish hanger for bridesmaids – This charming DIY craft makes a sweet gift for your bridesmaids. Just follow the surprisingly easy tutorial by NatashaLH. A beach location offers so many ways to incorporate tropical details in the ceremony. See the ideas we found for signage to stationery to ceremony accessories to the wedding toss! 2 – Married “By the Sea” Short Beach Ceremony Program – This flat-card program is just the thing for a casual seaside ceremony, doubling as a nice keepsake, too. By Sandpiper Wedding, via Zazzle. 3 – Aiffel Starfish Seashell Flower Girl Basket – Be sure your little lady is “in theme” as well, with this sweet fabric-wrapped basket trimmed with a starfish and seashell. Available via Amazon. 5 – Seashell-inspired Ring Pillow – This shell-shaped silk pillow is embellished with crystal beads and tiny pearls. Sure to lend a luxe look at the ceremony and as a decor piece at the reception. A Bellenza exclusive. 6 – Colorful Mini Beach Balls (25 pack, 5-inch size) – Stage a playful wedding toss with guests throwing these little beach balls in place of petals or confetti. Sold by CBR Adventures and Fulfilled by Amazon. The sun, sand, and sea have their charms – and their challenges! 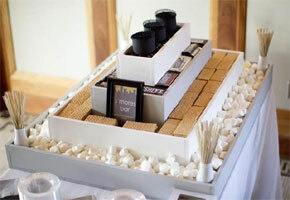 Help your guests keep as cool and comfy as possible with these thoughtful beach wedding amenities. 1 – Assorted Bamboo Sandals (3 pairs per set) – Set out tropical slippers in bright, cheerful colors in a beachside shoe valet. A welcome alternative to sand in the shoes! From L.A. Beauty, via Amazon. 2 – Personalized Themed Water Bottle Labels Beach Collection – Have a hydration station with personalized bottles of chilled water like these on standby. Available via Beau-coup. 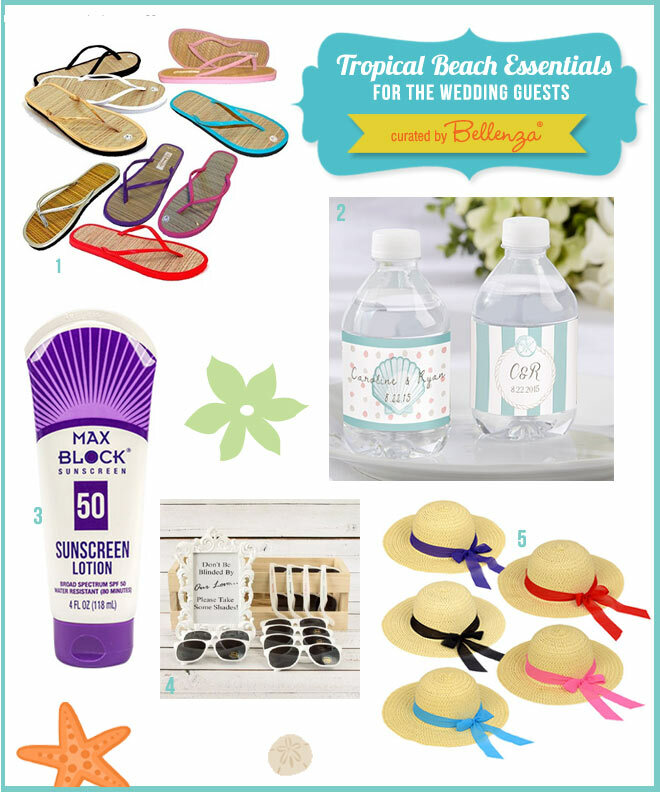 3 – Max Block SPF 50 Sunscreen Lotion – Stock up on mini sunscreen tubes for guests to take as needed, or include them in your wedding favor bags. Available in cases of 16, via Dollar Tree. 4 – Personalized Sunglasses – Cool plastic eyewear to beat the sun’s glare. 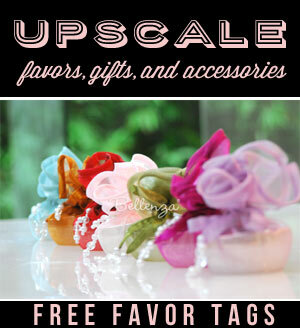 Choose from white, black, and hot pink and order personalized labels, via Beau-coup. 5 – Summer Sun Hats – Offer guests stylish sun protection with these tan straw hats trimmed with colored ribbon. Available in a case of 24 assorted colors, via Dollar Tree. 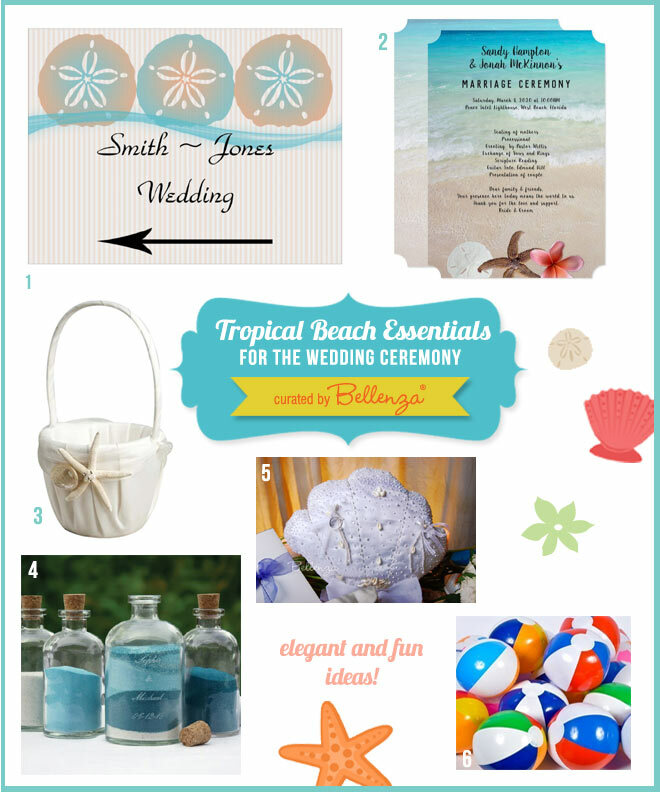 We hope these ideas and picks got you “warmed up” to plan your beach wedding this summer! 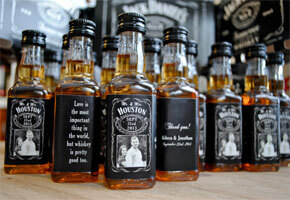 Previous Wedding Favors You Can Drink: Refreshing and Fun Ideas!